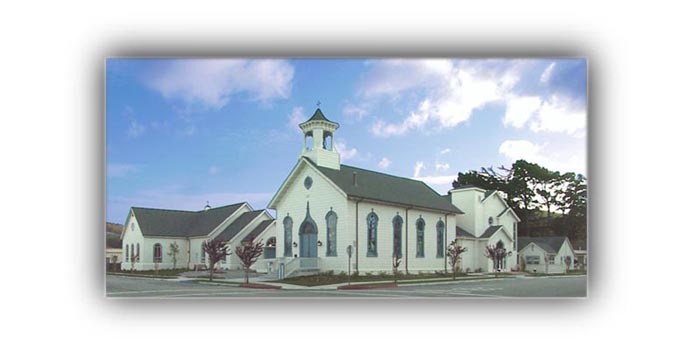 This Northern California church historic wedding chapel, built in 1872, is located in downtown Half Moon Bay California just minutes from San Francisco. The Half Moon Bay Methodist Church Wedding Chapel makes a charming and elegant site for a memorable church wedding. Full of rich Half Moon Bay California coastside history and tradition, and many beautiful stained glass windows. It seats approximately 80 guests. Located just a block off historic Main Street, the Methodist Church is close to restaurants, Bed & Breakfast Inns/Hotels, and retail shops. This Church is an excellent choice for a Northern California, Bay Area wedding location that is intimate and romantic, a charming historic setting.